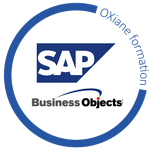 This 4 days course is the right course for anyone starting using BusinessObjects tools. The first day covers the WebI tool and the 3 others days will give you the right knowledges to start working with BO Universe Designer. After the End User part, this core three-day instructor-led course is designed to give you the comprehensive skills needed to design, build and maintain BusinessObjects 6.5, BusinessObjects XI R1/R2, and BusinessObjects XI 3.0/3.1 universes.